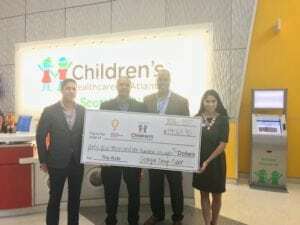 Pictured left to right: Program Director- John Cenerazzo, Regional Representatives- Clyde Richardson, John Hudson, Denise Amaya, Program Coordinator Children’s Healthcare of Atlanta- Nancy Koenig. Georgia Drug Card team taking a tour of Children’s Healthcare of Atlanta and presenting donations to date. Happy to help children and help people save on prescriptions!